Temperature controller, positioner, analog PI or P-PI cascade controller with LED display. Surface mounted. The TEM is a stand alone electronic temperature controller with two PI control loops for wall mounting. 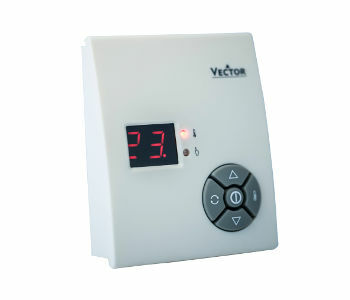 It features two PI sequences, one NTC temperature sensor and one analog input. The TEF features one analog 0...10 VDC output. A detailed parameterization is possible with the use of a simple configuration routine. The TEF can be configured using the standard operation terminal. No special tools or software is required.